Lexington Lights now offers you quality gemstones pretty enough to wear every day while offering you the protection and power inherent in each stone. 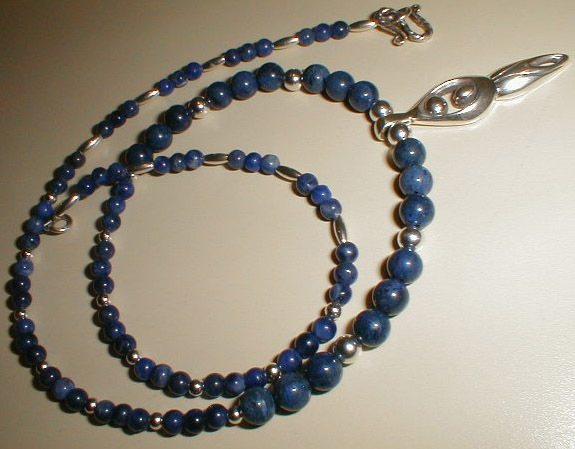 Our gemstones come from established reputable sources. As natural products of the earth, each bead and stone may vary slightly from one another in color or pattern; no two are exactly alike. Lexington Lights jewelry is unique and handcrafted and, best of all, priced far below what you'd have to pay elsewhere. Each stone is cleansed and purified before being used in our designs. As you wear the stones they will not only provide their special power but will become imprinted with your essence, making each one as individual and special as you are. The more often you wear your Lexington Lights sacred wear the more powerful for you they become. Click on each image for a closer look . . . and check back soon for new items . . .
Rhodonite is another gemstone of the heart chakra; it promotes maturity, helps you cast off confusion and move on toward the future. 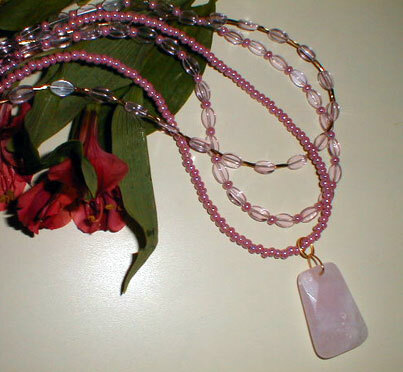 Rhodonite grounds your emotions and increases your self-esteem and self-confidence. 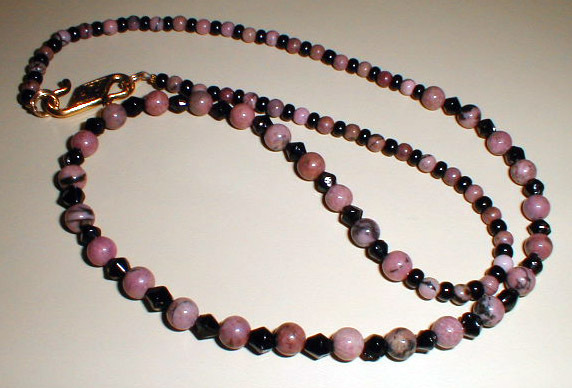 These genuine rhodonite stones are interspaced with black glass diamond-shaped beads that bring out the intricate natural dark veining of the stones. The necklace closes with a heavily gold-plated S hook, and is approximately 23 1/4" long.